Joshua Michail: Hitchens, His Life and His Work. 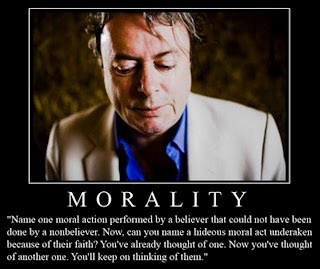 Hitchens, His Life and His Work. Only a few days ago now the world lost a prolific writer, an potent intellectual, and provocateur of thought. It seems that perhaps he was taken for granted by many, both by those who loved him and those who hated him. I know that I always had admired his intellect and work, even when on the odd occasion I may disagree. Though, no one is truly perfect, his most noticeable foibles – smoking cigarettes and drinking plenty of Johnny Walker Black Label to keep those companies in the black almost single handed – in some way seemed to only add character to him in a quite charming way. 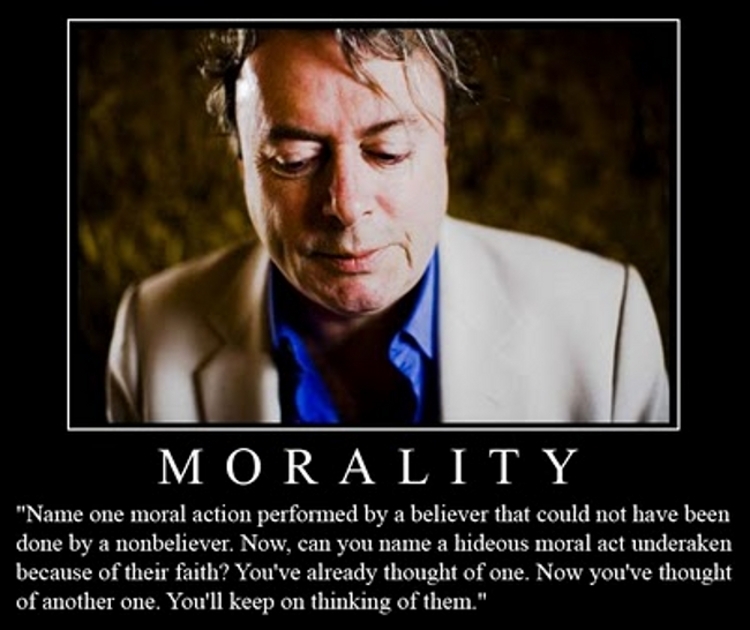 But then, on hearing of his death, I realized just how much the work of Christopher Hitchens really means to me. First, I should offer some background information, and I'd feel remiss if I didn't do so. Christopher Hitchens was born on the 13th of April of 1949, in Portsmouth, England. Both his mother and father served in the British Royal Navy during World War II. The two had met in Scotland during that time. Skipping ahead a bit for brevity's sake, in 1970 he began his journalistic career working as a corespondent for a British magazine called International Socialist, and his political inclinations at the time were quite leftist. But over time his political views would shift, though as is often the case with well reasoned people, his later political views were not entirely “conservative” either. In fact, he was mostly moderate, with leanings to conservative opinion on some issues, while still leaning liberal on other points. It's best to describe him as having been independent. He had immigrated to the United States in 1981, but only gained his American citizenship on his 58th birthday, the 13th of April, 2007. He even made his affirmation of citizenship on the steps of the memorial to one of his favorite men of history, Thomas Jefferson, in Washington DC. Thomas Paine and George Orwell were two among the others he had admired. He began writing for The Nation magazine after moving to the US, and later he was also a columnist who wrote for Slate, The Atlantic, Salon, Free Inquiry and Vanity Fair magazines. He was also an author, who's 2007 book, God Is Not Great, three weeks after being released reached number one on the New York Times 'Best Seller' list, it was also, in its first week, the number two 'Best Seller' on Amazon.com. He also wrote critiques that often ranged from less than flattering to outright infuriating to his subjects, among whom included both Bill and Hillary Clinton, Mother Teresa and Henry Kissinger, among many others. However, and it certainly seemed clear to me, Hitchens in this article was not saying that women are truly never funny. Not in any real misogynistic sense. Rather, he was exploring the evolutionary reasons why women tend to find the ability to be funny more important in men, than the other way around. He mentions that women very often list a man's ability to be funny as a characteristic that matters. Even if a woman doesn't explicitly say that it matters, she is likely to say, when telling her friends about a man, how funny he is. Among other things. And yet, men often don't make such a point about whether a woman is humorous. Hitchens acknowledged that women can be, and many are in fact, funny. But his all too often misunderstood point was that through our evolutionary course, thus far, women evolved to be attractive to men without the need to be funny, while men had to evolve to be funny as a significant part of being attractive. That must not in honesty be taken to mean that women are somehow incapable of being funny. Another case in which Hitchens is mistakenly cited against himself is his position on the Iraq war. He was not in favor of war, per se. He was a humanist after all. In being a humanist he saw the oppression and murders on the scale of tens of thousands of men, women and children non-combatants as a serious problem. Apparently those who have chosen to dislike, or even to hate, Hitchens can find anything to support their claims regardless of the truth. It should be known that he was no fan of George W Bush, nor Cheney, nor Rumsfeld. His point was that if we are to be intellectually honest, and if we are to care about the suffering of our fellow humans, then removing from power a torturous and murderous mafia-don of a dictator was a good thing. To the Kurds and Shi'ites in Iraq, Bush's reasoning for the invasion and removal of Saddam was not particularly important. Far more important to them is the fact that their heinous oppressor of the past several decades is now gone, never to return. The kind of thinking that appears to be prevalent lately is exemplified here. “I do think the media contributes to an overall mood that drives public opinion. He [Christopher Hitchens] does hold some responsibility for that. 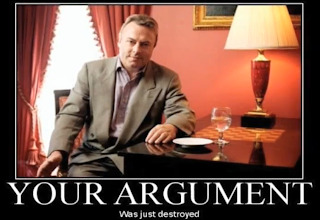 I think if his voice had been absent we would still have gone to war though.” That is a quote of an actual response to an online article about Hitchens. I won't attribute the quote, for the sake of originator, and because it will distract from the point here. To put this in context, the originator was talking about Hitchens' writings and media presence in which he explained why he thought that ultimately invading Iraq and removing Saddam Hussein was good. In the first sentence the media is accused of being complicit in the war in Iraq, in that the media influenced the public opinion, and thus the public support, in favor of the war. In the second sentence Hitchens is lumped into that group share of responsibility as part of the media. But then, in the third sentence, Hitchens is absolved of his share of responsibility for the war in Iraq that was thrust upon him. It's a bit absurd, and I've been seeing much of this on the web. But, all-in-all, this is all tiresome nonsense, a sort of 'much ado about nothing'. It is also no small point to address the issue of whether Saddam had WMDs (Weapons of Mass Destruction). Though the popular notion is that he did not, the fact is we know that he had used them before on most especially the Kurds in Iraq and on Iranians during the Iraq-Iran war. WMDs are not just nuclear bombs and missiles. Though the Bush regime may have very well preferred that the population think of it the way they did, that “nukes” were the issue. The very same chemical weapons that Saddam used to murder tens of thousands of Kurds, along with biological weapons like the anthrax that was delivered in mail to Senator Daschle and to TomBrokaw, are also weapons of mass destruction. The US Army has a school devoted to teaching soldiers about these weapons, and a special MOS (Military Occupational Specialty) devoted to handling them. The abbreviated and somewhat jargonistic term is known as “NBC” (Nuclear, Biological and Chemical). If anything the use of nerve agents and blistering agents like mustard gas and chlorine gas, surely must count as both horrific and murderous to masses of people and animals in a single use. It's an undeniable fact that Saddam ordered his military to use the chemical weapons on more that a few occasions and incidences spanning years, including after the Gulf War had ended. Regardless of whether Saddam possessed nuclear weapons or as he actually was, hoping and trying to get his bloodstained hands on them, he did have WMDs in the form of chemical weapons. The evidence that he had them could not be more clear than the fact that we knew, at the time, that he had gassed innocent people with bombs. 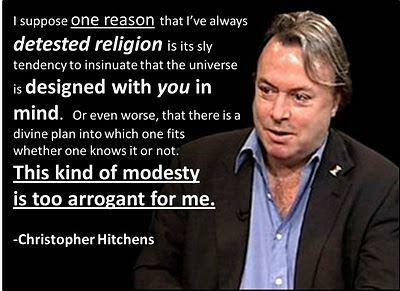 But it should be realized that Hitchens knew what he was doing. He would deliberately stimulate the minds of people, whether they liked it or not. After all, if you wish to show a captive tiger the truth of his vicious and terrible nature you must first rattle his cage. 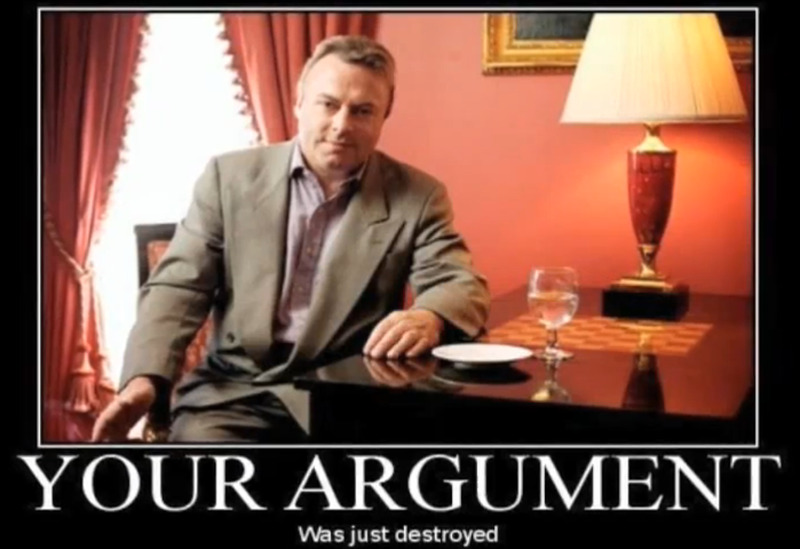 What Hitchens was doing was not mere ungracious antagonism nor face-spitting for it's own sake, but rather to cause discussion for the sake of getting the discourse into the light of day. He knew well the need for provocation, the sort that many who knew less would call contrarian, as if he were to them a simple unruly rebel. As he agreed with, and Ayaan Hirsi Ali has said about getting people to really start examining their beliefs “you must expose cognitive dissonance”. And to the intellectual dishonesty exposed by that dissonance as he would say “up with it we will not put”. 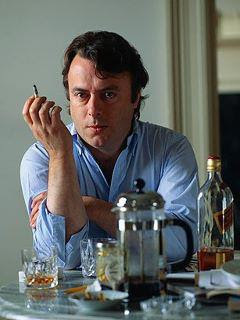 Throngs of religious people, of the many various flavors; Christians, Muslims, Jews and Hindus, remember Hitchens with a sour taste in their mouths. But, in perhaps a bit of a vindicating legacy many also remember him with great fondness. Many who were members of the religious cacophony once now give joyous thanks for his shining torch light. There will always be detractors, and certainly his blatant unapologetic, call-it-as-he-saw-it, style has given plenty of inconvenient discomfort and so aroused many an ire. But then the truth often hurts, and those who don't like hearing the truth will call those who speak it all sorts of foul names. This really is just a lashing-out, a rather expected childish behavior, of the sort that is rightfully dismissed with ease, pejoratively. What we'd be best to remember is the call to critical thinking and the rally around intellectual honesty that was Hitchens' labor of love. In deed, such is the manifestation of love for one's fellow humanity. To wish and to work for the betterment of humanity, especially by challenging the status quo and preconceived notions, is far too noble to be dismissed so easily on some trivial or contrived disagreement. So it is with gratefulness that we are to pick up the torch that Hitch has left for us. We are to proceed and continue the 'good fight', to promote honesty in intellect and thinking of a critical manner. To this end we must pick up his torch and appreciate his legacy. We must go forth and antagonize the world, to provoke a recognition of cognitive dissonance where it infests. We must ceaselessly, and en masse, promote and defend intellectual honesty and critical thinking. This is the legacy of Hitch and this is our charge! This is quite an excellently observed, and well written piece. I enjoyed reading it very much. Many thanks (and sorry for being anonymous). There's no problem with the anonymous commenting, don't worry. I appreciate your compliment. I'm glad that you enjoyed it, and thank you. Please feel free to share links to my blog and the essays you like.